SEJONG - The Moon Jae-in administration has yet to improve youth employment in the country despite its commitment to resolving the high jobless rate among those in their 20s, data from government agencies showed. 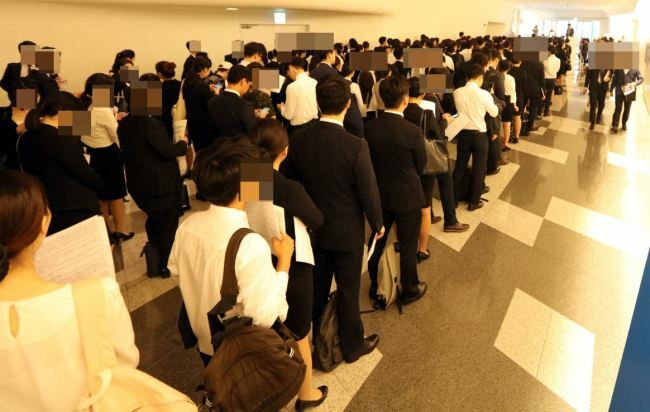 According to figures from the Ministry of Employment and Labor and Statistics Korea, the nation’s lackluster job market has dealt a serious blow to college and high school graduates. The unemployment rate for those between 15 and 29 years old was 10.7 percent in October, the highest on the basis of corresponding months since 2015, when the government introduced a new measurement method involving part-time working hours. Furthermore, the “extended unemployment rate” that includes job seekers, those who have abandoned job seeking and workers looking for night jobs as a sideline reached 22.5 percent. Although Statistics Korea highlighted that the number of employed in their 20s increased by 61,000 to about 3.73 million, some experts remain skeptical about the quality of the created jobs. The increase in youth employment could be attributed to an increase in part-time or short-term jobs rather than an improvement in stable jobs, said professor Kim Sung-hee of the Labor Research Institute of Korea University. Kim added that it is urgent for the government to push for the creation of fundamentally stable jobs, citing the extended unemployment rate. A Statistics Korea official agreed that the number of jobs with short working hours appears to have led the hiring of those in their 20s. On top of sluggish employment, the Moon administration revealed in July that it would be difficult to keep its earlier pledge related to the minimum wage. Such circumstances are believed to have affected youths’ sentiment toward the Moon administration. 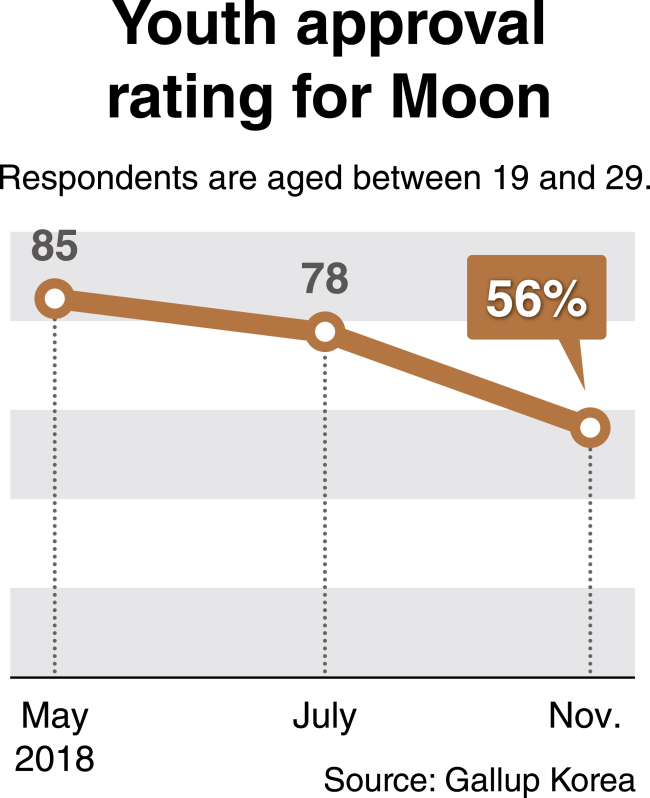 According to a poll released on Nov. 16 by Gallup Korea, Moon’s approval rating among those between 19 and 29 years old stood at 56 percent, a sharp drop of 29 percentage points from May, when the figure was 85 percent. In addition, the proportion of respondents who expressed negative views of the president’s state affairs among the 1,001 respondents came to 34 percent, compared with 6 percent half a year ago. The youngest group of voters had contributed to the election of Moon in May 2017, along with those in their 30s and 40s. Those in their 20s were quite active in past rallies calling for the impeachment of former President Part Geun-hye. Despite skyrocketing apartment prices in Seoul between 2017 and the first half of 2018, young Koreans’ support for Moon had appeared not to sway. However, their support for Moon has ranged between 50 and 60 percent since July, though the figure is higher compared to the approval ratings of former presidents. Survey industry experts stress that employment conditions have a large impact on youths’ sentiment. From March to September, the number of those in their 20s who were newly hired stayed under 50,000 each month. He added that young voters who had hoped the current administration would create a fair society may be frustrated due to cases of alleged hiring irregularities. A recent poll by the Economic Reform Research Institute showed that 6 in 10 people felt that government policies lack efficacy in vitalizing job opportunities. Negative opinions were particularly significant among male respondents in their 20s, 30s and 40s, said the institute. A fellow at Hangil Research said policies such as converting irregular workers to regular positions and the reform of corporate pensions only reinforce the job security of existing workers.